And the death of Cuba’s long-time dictator gives hope that the people of that island nation may soon escape communist tyranny. Moreover, one certainly hopes that the lunatic leadership of North Korea’s brutal regime won’t last forever. Let’s cross our fingers that these evil governments will soon lose power. But that’s only the first step. We also need to think about the policies that would enable these nations to undo the damage of pervasive socialism. We can learn some lessons by looking at the experience of post-communist nations in Eastern Europe, which is a topic I addressed in the latest edition of The Conservative, which is the quarterly magazine published by the Alliance of Conservatives and Reformers in Europe. I started the article with some broad observations about grim political and economic impact of communism. Communism was an awful system for people trapped behind the Iron Curtain. The political cost was enormous. Personal rights and individual liberties were sacrificed to protect the power of the state. Human rights were abused, dissidents were imprisoned, and some were even killed. Communism also imposed huge economic costs. Collectivized agriculture, central planning, price controls, and government-run industries were among the policies that resulted in a debilitating misallocation of resources. And because labor and capital were poorly utilized, living standards lagged far behind western nations. The good news is that the Soviet Empire collapsed, the Berlin Wall was dismantled, and democratic forms of government are now the norm in Eastern Europe. But good news isn’t perfect news. Nations that emerged from the Soviet Bloc are still economic laggards. And if you dig into the latest version of Economic Freedom of the World, a big problem is that post-communist nations have not been very successful in defending property rights and implementing the rule of law. Establishing genuine capitalism, though, has been a bigger challenge. Part of the problem is policy. 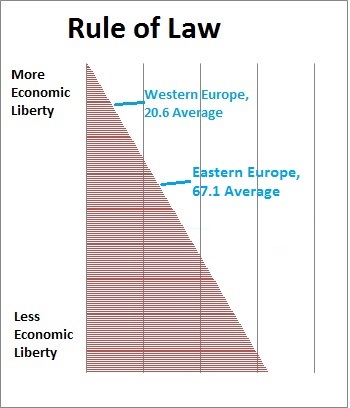 And to be more specific, data from the Fraser’s Institute’s Economic Freedom of the World shows that the major difference today between Western Europe and Eastern Europe (nations that were part of the Soviet Bloc) is that the former get much better scores for “Legal System and Property Rights.” Indeed, the average ranking of Western European nations is 20.6 (with 1 being the best) while the average ranking of Eastern European countries is 67.1 (Economic Freedom of the World ranks 159 jurisdictions). Here’s a graph comparing Western European nations with Eastern European nations. As you can see, this is an area where Western Europe leads the world. Nordic nations tend to be at the very top of the rankings (thus helping to offset bad fiscal policy in those countries), and other countries in the region also are highly ranked (though a few countries in the region, such as Italy and Greece, don’t get good scores). Eastern European countries, by contrast, don’t do well. There’s a significant gap when looking at average scores. Indeed, only Estonia ranks in the top 25. And bad scores in this category are akin to putting a house on a foundation of sand. Other policies may create a house that looks very nice, but it probably won’t last very long on the unstable foundation. And speaking of other policies, post-communist nations have better fiscal policy than the countries from Western Europe. Or, to be more accurate, they have less-worse fiscal policy. If you examine the overall ratings for “Size of Government,” Eastern European nations actually are ranked significantly better, with an average ranking of 89.2 compared to 129.2 for Western European countries. This is because tax rates tend to be lower (many former Soviet Bloc nations have flat tax regimes, for instance) and welfare states aren’t as burdensome. As I already hinted, doing “significantly better” on fiscal policy than Western Europe does not mean Eastern Europe has good fiscal policy. Indeed, an average ranking of 89 means that most Eastern European nations are in the bottom half of the world. So while it’s good that some Eastern European nations have flat taxes, that’s not an economic elixir if there are very high payroll taxes, stifling value-added taxes, and onerous energy taxes. And since the burden of government spending is extremely onerous in Western Europe, it’s hardly an impressive achievement that Eastern Europe ranks slightly higher. Though there’s one aspect of fiscal policy where the post-communist countries are lagging their neighbors to the west. 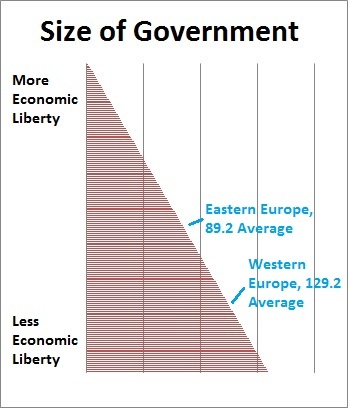 …if you dig into the details and examine the various components that determine “Size of Government,” there’s one area where Eastern Europe lags. The numbers for “Government Enterprises and Investment” are better in Western Europe. …In other words, politicians play too large a role in the allocation of capital in former communist nations. To put that message in blunter terms, there’s too much cronyism in Eastern Europe. So long as politicians can directly (state-owned enterprises) or indirectly (handouts, subsidies, and bailouts) provide favors and tilt the playing field, the enriching forces of private markets will be stunted. Which is why I shared this conclusion in my article. If you want to close with some good news, I did point out in the article that there are some bright spots in the region, especially Estonia, though Poland also has made big progress. P.S. Courtesy of Reddit‘s libertarian page, here’s an amusing cartoon strip. It doesn’t quite meet the requirement for getting added to my “Government in Cartoons” page, but it definitely could be part of this collection of anti-politician jokes. @Mike It is dead. It’s just been replaced with ogliarchs, crime bosses, government corruption, and crony capitalist. Even they know that they can extract far more wealth from a nation under capitalism then communism. You think communism is dead in Russia? I doubt that very much. Sure – the face shown to the world suggests that it is, but not convinced that that is the case.